The unusual circuit technique ensures total symmetry around the output stage, this forms the basis of this amplifier and continues to form the basis of CR power amplifier products. Power tube sockets are hard wired to the circuit board to guarantee reliability and isolate other components from associated heat stress. A front mounted 3.5mm socket for a MP3 player analogue input complements input sources. Five input sources are selected by high quality relays minimising signal path lengths. Adjustment of tube biasing was an inconvenient operation previously, now the trim potentiometers are accessible through the top cover greatly simplifying a dealer’s or service technician’s task. 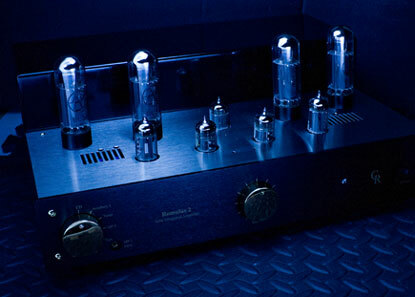 A rear mounted 5-pin socket provides easy monitoring of tube bias setting. New styling departs from the trade mark polished stainless steel for a more conservative black or silver anodised finish that offers an more luxurious finish some may feel is more compatible with other HI Fi separates. A second production run will be available December/January after the first batch was all pre-sold. A hand full of pre production units have been pre sold and the next production is expected in early 2015.